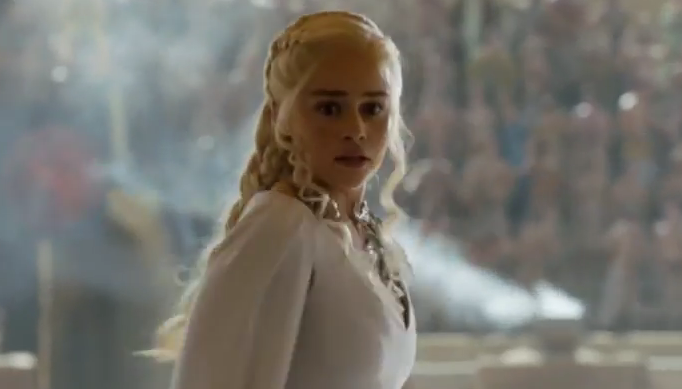 HBO has released an action-packed Game of Thrones trailer for Season 5 that ramps up the footage including Tyrion looking aghast at a full grown Drogon, Daenerys Targaryen plotting her return to Westeros with her "break the wheel" speech, Jon Snow playing arbitrator, and much more! The new trailer was released during the Apple keynote address that gives the tech giant a 3-month head start with HBO's new subscriber model HBO NOW on Apple devices before the competition. The new service will cost $14.99 a month will be available for the season premiere of Games of Thrones on April 12.